Does anybody have room for a well groomed handsome young man such as myself? I don't bite and am low maintenance. I will be flying in Saturday morning and will probably cab to the LAN, then I will just stay overnight and leave at the earliest flight Sunday morning. 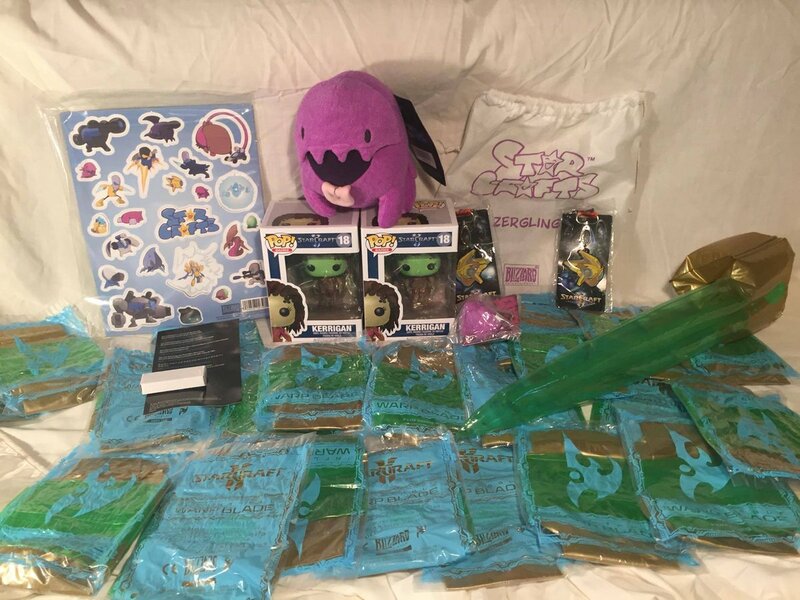 We have got a whole bunch of Blizzard loot to giveaway during the day. All kinds of things ranging from a Battle.net Authenticator to Protoss Warp Blades! Got to be in it to win it! Last edited by ROOTProbe; Thu, 1st-Sep-2016 at 5:30 PM. The winner will not only take home some sweet money, but also this trophy! Just under 2 weeks until the event. Get hyped! can winner have pix of him/her kissing it? Flights and hotel booked, the DoMo is coming. I think I might come in wearing my old Snx jersey so people will see my name on the back and come say hi. Missing a lot of the usual competitive faces at this LAN so I'm keen to make some new friends . hello, ill be joining in unless something happens this week. how much would you guys recommend bringing? Money wise, I would be bringing $20 just to be safe. This means that if you lose in the tournament you can still use the computer for as long as you want. Probably won't have to spend all that if you don't want to though. Updated the op with some additional prizes. Hope to see everyone there on Saturday! Tomorrow I will do a big post with everything you need to know details wise and about when you need to get to the venue! Please arrive at the venue between 10:30 - 11:00. The earlier the better. The tournament is set to start at !!!!!!11:00!!!!!! This is so that we can complete the brackets promptly and you can get your computers set up quickly as possible so that the start of the tournament is smooth. They have everything you need at the venue. Computers, Moniters, keyboards, mouses, headphones, mousepads etc. HOWEVER, if you want to bring your own keyboard, mouse, headphone, mousepad you are welcome to. The allocated computers for our tournament are all on the bottom level. Just walk into the building and you are right there. To get to the venue via public transport you can get there a few ways. From Flinders Street walk across the river and down to crown. Find city road one main road in. From Southern Cross Station take the #12 down to the the stop near the macca's. Otherwise you can just walk from the station. Roughly 20 minute walk. Please see Sean or Eugene when you first arrive to check in for the tournament. If you are going to be late, don't worry, just let us know and you will still be added to the bracket. This could be on facebook, sc2sea, teamliquid, twitter (@SC2Probe, @eastuto), skype,discord. BUT PLEASE LET US KNOW. We are really looking forward to running this event, hope to see you all there tomorrow! Decided to abandon wearing my old Snx jersey. I will be wearing a black tshirt or possibly a red wine peacoat on top if it's cold. So come say hi to me . EDIT: Hahaha good one lads. Turns out I won't be able to make it tomorrow. GG I hope you all enjoy yourselves! Last edited by ThatGuyDoMo; Fri, 16th-Sep-2016 at 7:49 PM. Congratulations to PiG for taking first place. Also congratulations to Seither and Rize for taking 2nd and 3rd. This was a amazing event, thank you very much for everyone involved in organizing it. i enjoyed myself immensely. will keep a eye out for the next one and will try my best to come thanks for the games, chats, and fun. Considering this is my first ever event I have nothing to compare it to but it was very fun and re-watching the vod's has been a blast! Thanks everyone for organizing it and especially thanks to Probe for convincing me to come. It was great fun! I enjoyed it a lot. Everyone was so nice and chat was insane. Wish I wasn't so shy all the time but oh well I'll get to know people better over time. I still don't quite fully grasp the fact I'm so liked and semi popular. I'm just another guy trying to learn and play Starcraft.